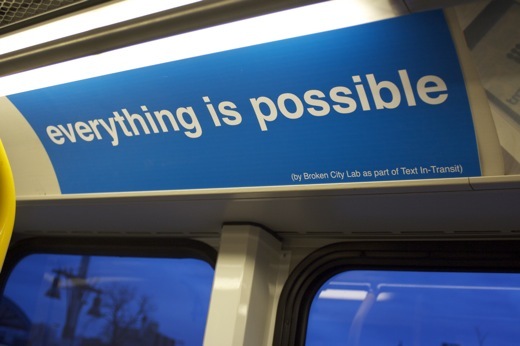 Text In-Transit on the Windsor/Detroit tunnel bus this morning. So perfect, this is exactly where we would have hoped to see this panel! Thanks for taking the photo, Robert! Transit Windsor Panels on the Buses! This morning, on one of Transit Windsor’s new hybrid buses, we saw one of the nearly 100 Text In-Transit panels (this is the first panel on this new bus, as far as we could tell anyways). I believe they will all be installed on Transit Windsor’s entire fleet in the coming days. Let us know if you see one (and try to take a picture)! The panel above was submitted by Ross Moncur. Danielle and I picked up 84 of the Text In-Transit panels back from the printers today. We didn’t even open up the packages though, hoping to save the surprise for when we actually get to install them. The panels for Text In-Transit have been sent off to the printers. We should be able to install these on Transit Windsor buses in the next couple of weeks!!! We settled on 90 unique panels + 10 title card panels. Again, we can’t thank everyone enough for the support and participation—I’m hugely excited to see these all printed and installed! Last night Danielle and I went to the downtown Transit Windsor terminal to install the first five test panels we had printed for Text In-Transit. The panels read: everything is possible, YOU MADE MY DAY, YOU ARE THE CITY, YOU CHANGED EVERYTHING, and changing the world starts by changing this city. We had to install these panels while the buses momentarily stopped at the terminal, so it was pretty quick. When we install the rest of the panels later this month, we’ll do it at the garage. I picked up five test panels on Friday from the printers and got a test shot of them installed on the buses. These first five panels were made up internally at BCL (we still haven’t had the chance to start going through all the submissions yet). I’ll be going back to the downtown terminal this evening to actually install the five test panels on a couple of buses, so keep an eye out for them over the next week. I’ll post some more photos of the panels installed tomorrow. New Text In-Transit Submission Form! There’s now a new submission form that allows you to get a quick preview of what your Text In-Transit panel could look like, along with a fun little colour swatch. If you’ve already submitted, it’s worth submitting more just to try this out, and if you haven’t submitted yet—get on it!!! Check out the NEW Text In-Transit Call for Submissions page! Or if you’re more comfortable with an old fashioned email, that’s still fine too. 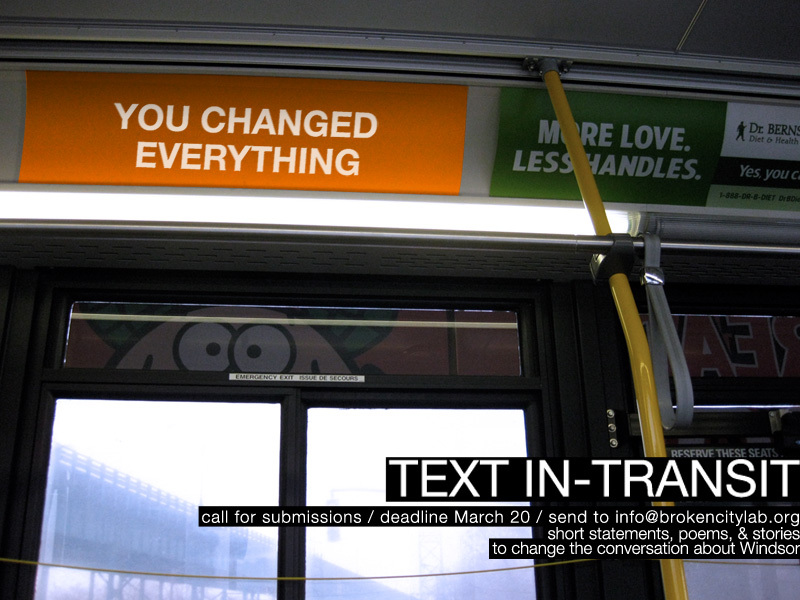 Text In-Transit is a Broken City Lab project where we’re partnering with Transit Windsor to install a number of text-based creative works amongst the ads in the headspace on buses. We’re looking for submissions of short statements, poems, and stories from anyone in the city that will help to change the conversation about Windsor!!! *** Please send your submission(s) to info@brokencitylab.org by March 20, 2009. We’ll be curating the submissions, so feel free to send more than one. As well, this project is made possible by Transit Windsor, OPIRG, MYAC and The Arts Society at the University of Windsor.